The Selecta division of Silvan introduces the PiusiBox, an inclusive diesel pump kit designed for efficient diesel transfer. The PiusiBox is manufactured by the Italian company, Piusi that is known internationally for its innovative range of diesel fuel pumping and transfer products. Piusi is represented in Australia by the Selecta division of Silvan Australia . 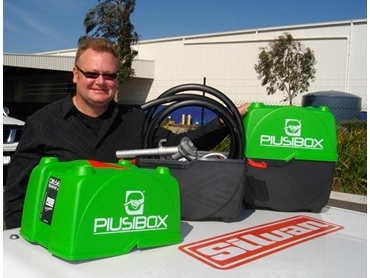 The new PiusiBox diesel transfer system is a highly portable pump kit for transferring diesel from a drum or storage tank when required and also offers several benefits for Australian users of diesel fuel. The self-contained PiusiBox is protected within a stylish easy-to-handle case and is designed to provide a portable diesel transfer facility where a dedicated transfer system is not available. The PiusiBox diesel transfer system comprises of a BP 3000 self priming vane pump with 45 LPM flow capacity mounted within the container. The pump draws on a 12V battery supply, normally from the vehicle on which it is carried, using the four metres of power cord and alligator clips supplied with the unit. An internal bypass restricts the flow of fuel when the gun is switched off so that the excess fuel is recirculated within the pump. A special foot filter valve twists open or closed and also stops diesel spills. The PiusiBox diesel transfer system comes with four metres of hose, a manual dispensing gun as well as fittings and clamps to set up suction and delivery lines in addition to a carry case to store all the equipment safely and conveniently. PiusiBox diesel transfer systems replace the typical hose and hand pump set that is usually carried on a vehicle or stored in a tool box. Selecta’s Product Development Manager, Greg Everett says that these rudimentary transfer systems typically attract dirt and debris that could cause fuel contamination or blockages. He adds that the PiusiBox prevents contamination, helps to avoid diesel spills on a job site or workplace and can be packed away safely in the compact carry case to protect against dirt, grit or debris.